Linda Leviton recently taught a workshop on large scale foldforming at the Cultural Arts Center in Columbus, OH. 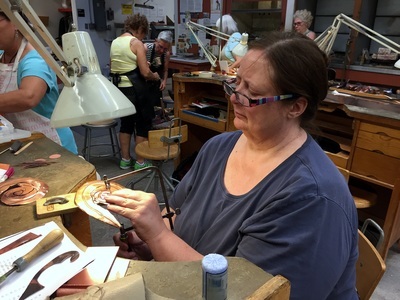 Not only is Linda a brilliant local artist, but she also won Honorable Mention and two Jurors' Choice nominations in the 2015 Lewton-Brain Foldform Competition, a global event for metal artists. Learn more in Part I of this story. Today we'll take a closer look at the sculpture Linda brought to class as an example for her students (right). 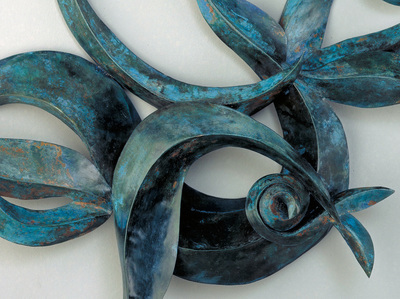 She used scored line folds or scoring & bending to create dramatic 3-D forms from flat sheet metal. The idea behind the scored line fold is to weaken the sheet metal where you want to fold it. 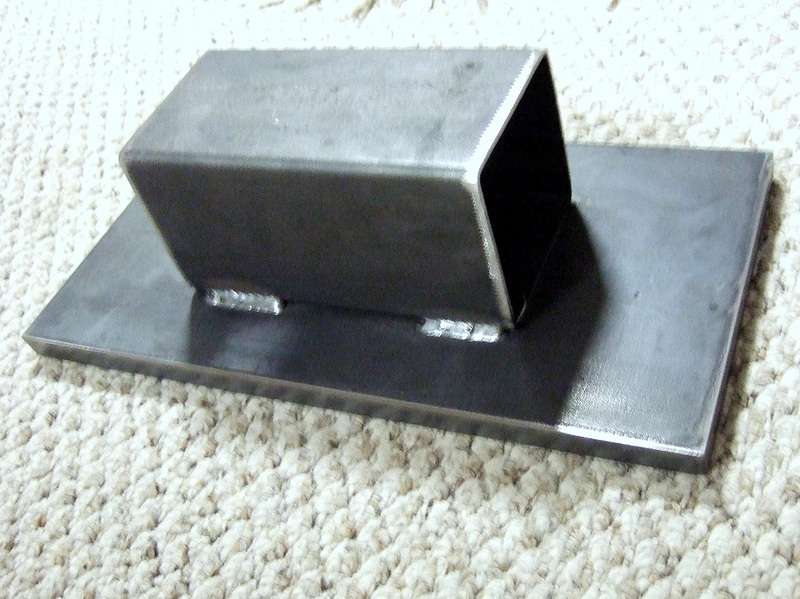 A quick, low tech way to achieve this is by pressing or hammering hard wire into the sheet. The wire will thin out the sheet metal where it makes contact, creating a line that will bend under pressure after it's annealed. This technique is especially helpful for curved folds. Watch as Linda explains how the curve of the wire affects the results, and shows how to secure the wire to the sheet before hammering. 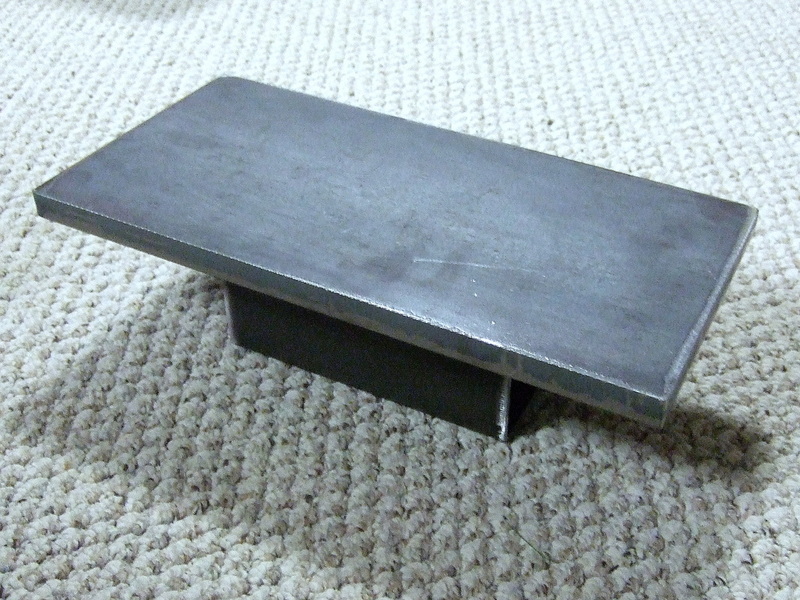 After the wire is curved and taped down, cover your anvil surface or steel bench block with leather and place the piece on top. Using a slightly domed hammer, pound along the wire until it is evenly indented into the metal. When you've hammered enough, the wire track will be clearly visible on the opposite side but won't have cut through. There is a little trial and error as you learn when to stop. Later if the line you made in this step is slightly too thin for structural integrity, melt some solder along the inside of the fold to reinforce it. Get creative about your leather sources! Linda salvaged this piece from a discarded couch-- great idea. You might find an old leather jacket, large handbag, or even a long leather skirt at a local second hand store. 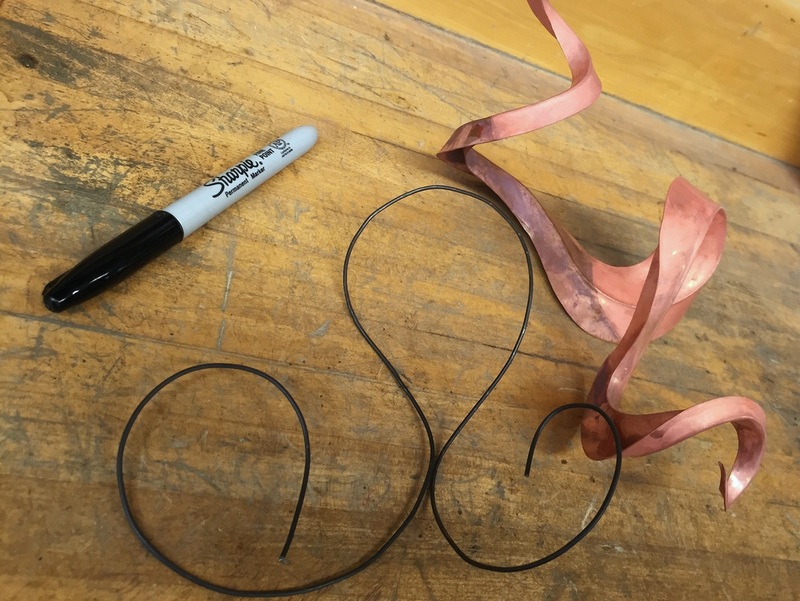 In this clip, Linda cuts around the line left by her wire and bends the piece. Notice how the final form can be manipulated into the shape you want. The students in this workshop were on fire! Take a look at some pics and video clips, and see for yourself. So there you have it-- a spectacular class taught by Linda Leviton at the Cultural Arts Center in Columbus, OH this past June. Do you have experience with this technique or with the Cultural Arts Center in Columbus? I'd love to hear from you so please leave me a comment below! In late June of this year, the Cultural Arts Center here in Columbus, OH hosted a four-day workshop on foldforming. Intrigued by its focus on creating larger scale works, I visited the class for a few hours to interview the class and snap some pics for this story. The instructor was Linda Leviton, a talented local artist who creates commissioned metal installations for spaces like corporate atriums, hospitals, and universities. To set the stage... I didn't realize at the time that Linda had submitted three pieces for consideration in the 2015 Lewton-Brain Foldform Competition. And how did that turn out? In a unanimous decision, from among entries submitted by artists in Aruba, Australia, Canada, England, Ireland, Mexico, New Zealand, Scotland, and the U.S. -- ALL of Linda's pieces were recognized by the jury. Who judged her work? The 2015 jurors are all leaders in the international metal arts community; Charles Lewton-Brain, Artist Goldsmith and Foldforming Pioneer, Hazel Wheaton, Editor of Art Jewelry magazine, and Dr. Hanuman Aspler, Owner / Co-Founder of The Ganoksin Project. No small accomplishment -- congrats, Linda! Here they are! 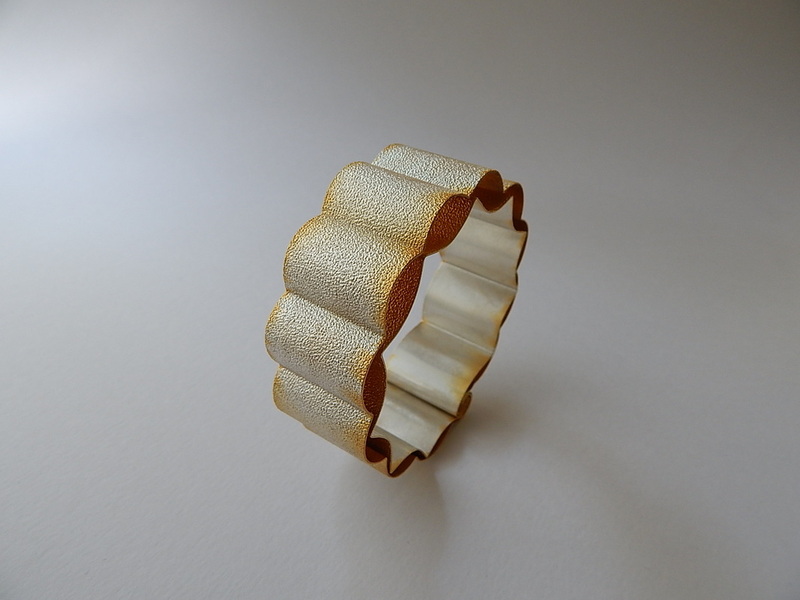 Enjoy -- and then scroll down to get some tips from Linda's foldforming workshop. Linda's four-day foldforming workshop at the Cultural Arts Center (CAC) in Columbus, OH, was a well-attended, high energy event. I collected lots of great images, videos, and tips to share. These are some pics of Linda and her students. Let's start with some of Linda's general tips and work our way to foldforming. 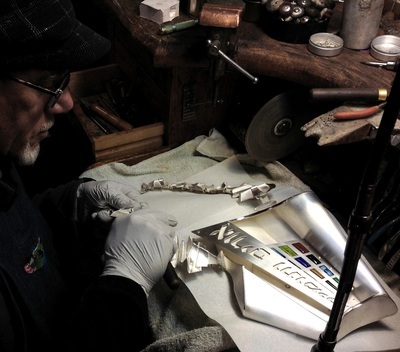 There are so many ways to apply color to metal that sometimes we overlook the basics! Linda often uses oil or acrylic paint. This gives her complete control over the final color and design. Her trick? She applies automotive self-etching primer first, to prepare the metal surface for paint. These vertical shears are new to me so it helped to see them in action. What a great angle for cutting metal. Use a belt sander to smooth the cutting edges of your sheers. They will leave smoother edges on your metal, reducing the sanding your pieces require after cutting. 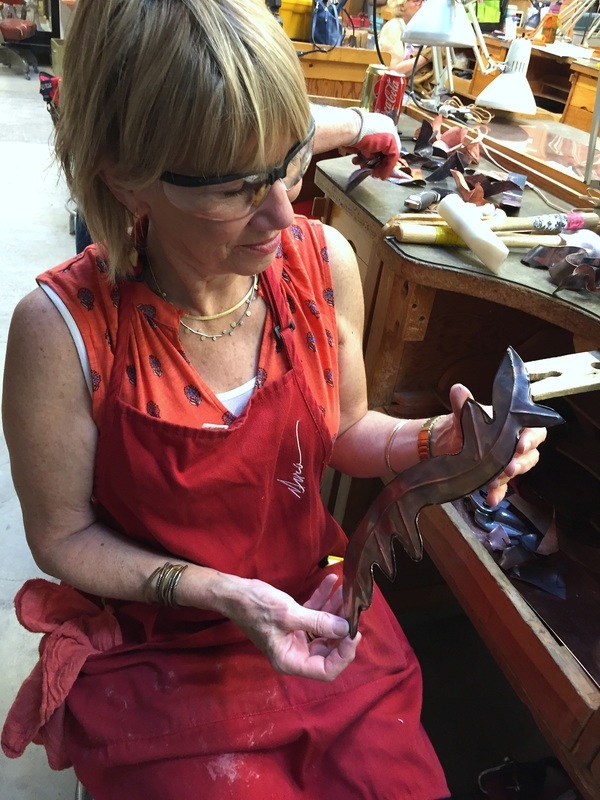 In this video, Linda creates a flower by attaching a copper stem to a foldformed Heistad Cup. 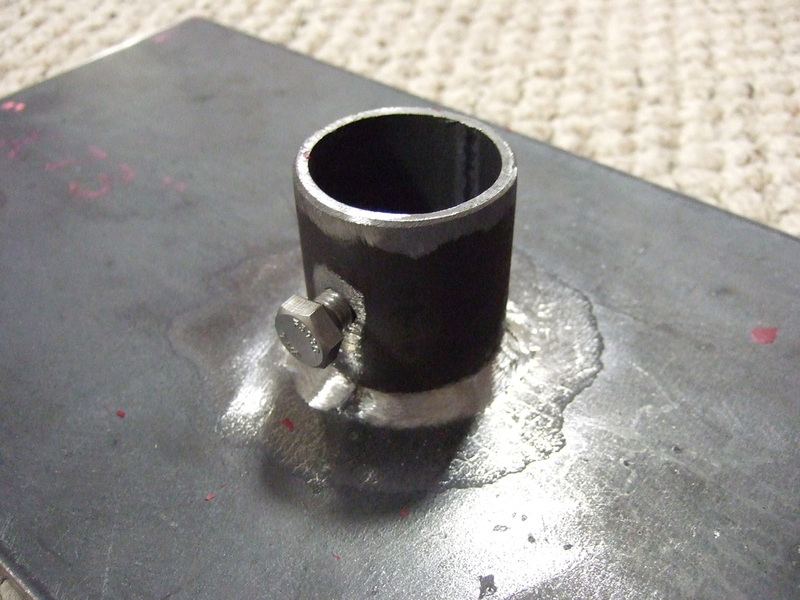 She uses brazing rod from a welders' supply outlet -- or in this case, from a junkyard! Many of us working in small metals are familiar only with silver and gold solder. Brazing rod is a great solution for connecting copper pieces in a large work. Linda's roots are in quilting, an art form that often calls for assembling many small components into a large pattern. This design sensibility transfers well to her large scale metal installations. Linda's work is often based on patterns and repetition of smaller shapes. Listen as she explains how she creates a template for her components and then creates multiples that match. Let's take a moment for a brief public service announcement for my local friends. So many Columbus folks have never heard of the Cultural Arts Center and really must check it out. When I signed up for my first class at the CAC about five years ago, I drove by it twice before even checking the address. Why? Because the class was so inexpensive -- well under $100 for eight 3-hour sessions -- I was expecting a run-down urban disaster running on a shoestring! Instead, the CAC might just be the best kept secret in Columbus. Subsidized by the city, the facility is an artist's dream-- diverse, well-stocked, and expertly staffed. They offer classes in the visual arts... metal, clay, painting, fiber, and more. 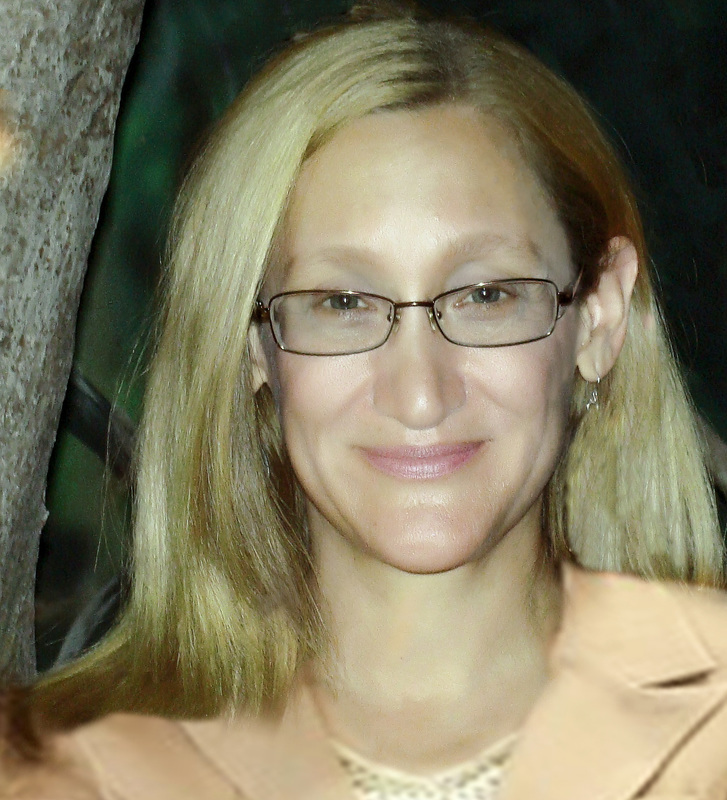 Kristi Kloss runs the small metals program and she really knows her stuff! Let's pause here and do this story in a couple of parts. There is so much great video to share and we're getting a little data-heavy for a blog post. Please check back for part II in a few days, ok? Time to begin planning your submission for next year! FIRST PLACE: Dan Lippitt, Madison, WI, U.S.
SECOND PLACE: Ira Sherman, www.irasherman.com, Denver, CO, U.S.
THIRD PLACE: Christina Brandewie, www.cabbjewelry.com, Cincinnati, OH, U.S. HONORABLE MENTION: Linda Leviton, lindaleviton.com, Lewis Center, OH, U.S.
Nick Grant Barnes, www.nickgrantbarnes.com, Silver Spring, MD, U.S.
Holly Carter, hollycarterart.com, Richmond, CA, U.S.
John M. Cohea, jmcknives.blademakers.com, Nettleton, MS, U.S.
Melissa Davenport, Scottdale, PA, U.S.
Wendy Edsall-Kerwin, www.hammerstrokeandfire.com, Elizabethtown, PA, U.S.
Angela Fung, www.angelafung.net/paperartist, Hassocks, U.K.
Kerye Hartzell, artkeryeleigh.com, Richmond, TX, U.S.
Deborah Jemmott, www.debjemmott.com, San Marcos, CA, U.S.
Denys Knight, www.accidentalhammer.com, Bonners Ferry, ID, U.S.
Goran Konjevod, organicorigami.com, Livermore, CA, U.S.
Ellen Krieger, www.ellenkriegerjewelry.com, McLean, VA, U.S.
Ed Lay, www.edlay.info, El Cerrito, CA, U.S.
Linda Leviton, lindaleviton.com, Lewis Center, OH, U.S.
Daniel Lippitt, Madison, WI, U.S.
Louise Mary Muttitt, www.louisemarydesigns.co.uk, Burton upon Trent, U.K.
Sher Novak, www.shernovak.com, Albany, CA, U.S.
Stella Rose Powell, www.silverfallsjewelry.com, Bend, OR, U.S.
Bradley Sanders, www.bradleysandersart.com, Shepherdstown, WV, U.S.
Kest Schwartzman, www.vagabondmetalworks.com, Frederick, MD, U.S. Entries Are In - Who Will Win? YOU GUYS. The competition closed last night, the judges will get access tonight, and at this moment I'm the ONLY person on the planet who has seen all the entries for the 2015 Lewton-Brain Competition. Oh. My. Gosh. It's making me crazy that no one else has seen it yet. Nine countries represented-- and just lovely, amazing work. So much variety and creativity this year. The judges are going to have a rough time deciding this one, I promise! Since I can't show you this year's entries, I thought it would be fun to share a blast from the past. Pictured on the left is a favorite of mine -- a 2013 Jurors' Choice by the very talented Pat Downing. It's one you can visit easily, too, since it was a commission for the Westfield University Town Center mall in La Jolla, CA. On Pat's website you'll find a process video for this sculpture and more of his work. If you want to see ALL the past winners and Jurors' Choice selections, check out the competition page. There you'll find images, press links, and all the past videos. The 2015 Lewton-Brain Foldform Competition is now closed for entries. Artists from nine countries across the globe submitted absolutely LOVELY pieces and an especially wide variety of art forms this year. Over the next few weeks, Judges Charles Lewton-Brain, Hazel Wheaton, and Hanuman Aspler must choose the winners and Jurors' Choice for 2015 -- a very challenging task, considering this field of entries! 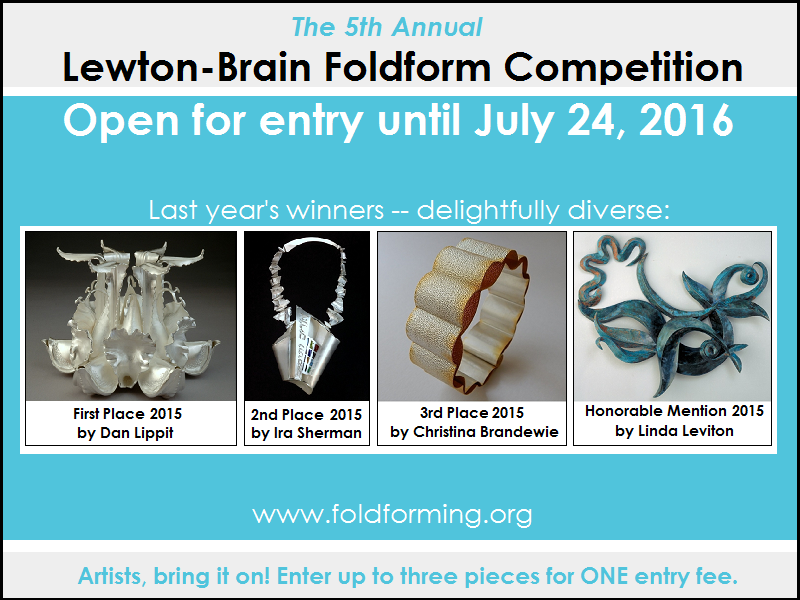 Winners will be announced at the Lewton-Brain Foldform Competition Awards Dinner at 6PM on Friday July 24th at the Seligmann Center for the Arts in Sugar Loaf, NY. Join Charles Lewton-Brain for a relaxing Friday night dinner over a farm-to-table meal catered by Black Dirt Gourmet, with good food, wine, friends, and an intimate evening of conversation with this inventive Canadian arts pioneer. After dinner we drop the screen to view the winning entries to this year's annual Lewton-Brain Foldform Competition. General admission $25/ Foldforming for Vessels students $15. 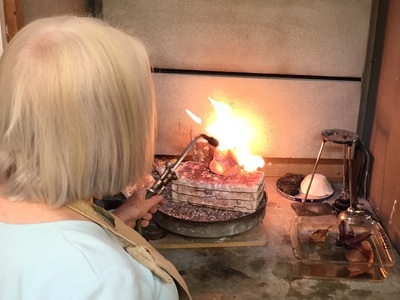 EARLIER THAT DAY (just a few minutes from the awards dinner) the Center for Metal Arts will present the first day of Foldforming for Vessels with Charles Lewton-Brain, July 24-27, 2015. A few seats are left -- grab them now for the early bird discount! The Center for Metal Arts is about an hour NW of NYC. Dinner tickets and workshop registration info are here. Exciting times to come! 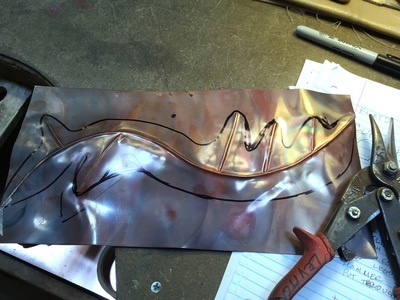 Yes, there is a fantastic workshop coming up at the Center for Metal Arts (CMA). 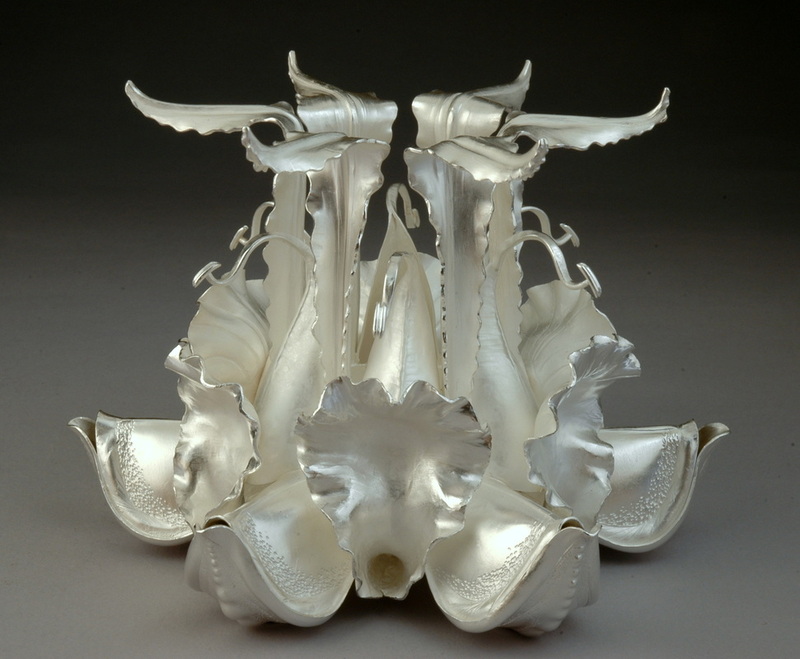 Charles Lewton-Brain will be teaching Foldforming for Vessels for the first time in the U.S. this year. Yes, I do work for the school -- but I come by this enthusiasm honestly. I first visited CMA as a student in Charles' foldforming workshop. It's what drew me in and led me to stay. Unforgettable experience-- amazing place! If you're considering the class, visit my live blog from 2012 and see TONS of pics and video showing Charles Lewton-Brain's foldforming workshop. It was all written from a student's perspective. In that class you left with samples -- in this one, you'll leave with vessels! And yes, the 2015 Lewton-Brain Foldform Competition Awards Dinner is on the first night of class, just a few minutes away, catered by W. Rogowski Farm / Black Dirt Gourmet. Dinner last year was seriously delicious. And it's a lot of fun to be among the first to know the competition results! Don't hesitate to contact me with any questions or just say hi. You can comment below or message me in Facebook. 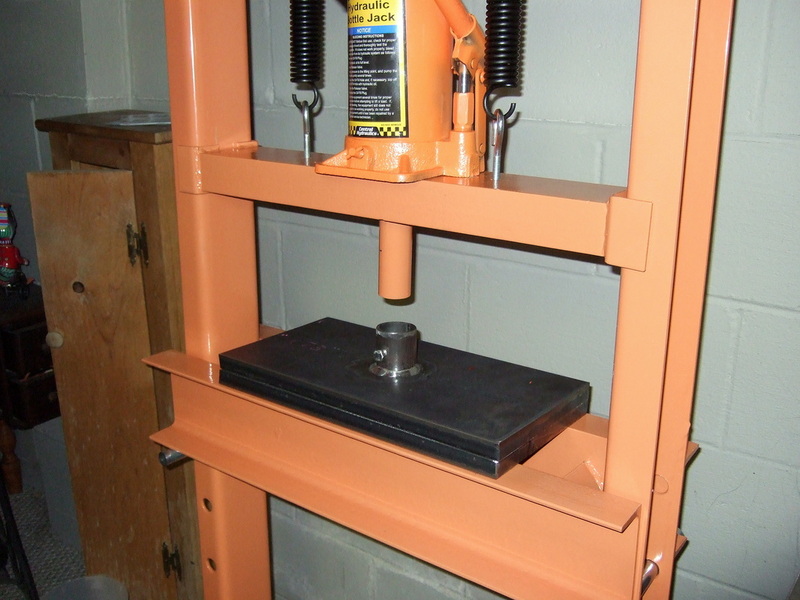 There are some great hydraulic presses made especially for use with jewelry and small metals. My budget isn't up for that right now so I went to Harbor Freight and bought one for $199. Then I hired a local craftsman to make two 8x12" removable platens-- and it works like a charm. So yeah, Harbor Freight is always good for starting a heated discussion about cost vs. quality and you get what you pay for. No denying that. I'm super happy with some products and not so much with others. Should you decide to embark on a similar adventure, my disclaimer is that your results may vary. Be safe, be careful, do your own research-- at your own risk. This is just my story to share. Before assembling the press, I took the two middle crossbars to Fortin Ironworks, a local metal fabrication shop here in Columbus, OH. They viewed an image of the assembled press on Harbor Freight's website, measured the crossbars, and proposed a design. Two days later the parts were ready. The job cost $107 for labor and all that steel. So this 20 ton hydraulic press ended up costing me about $300. This is the new bottom platen. The craftsman suggested a removable solution to retain flexibility in how the press can be used. 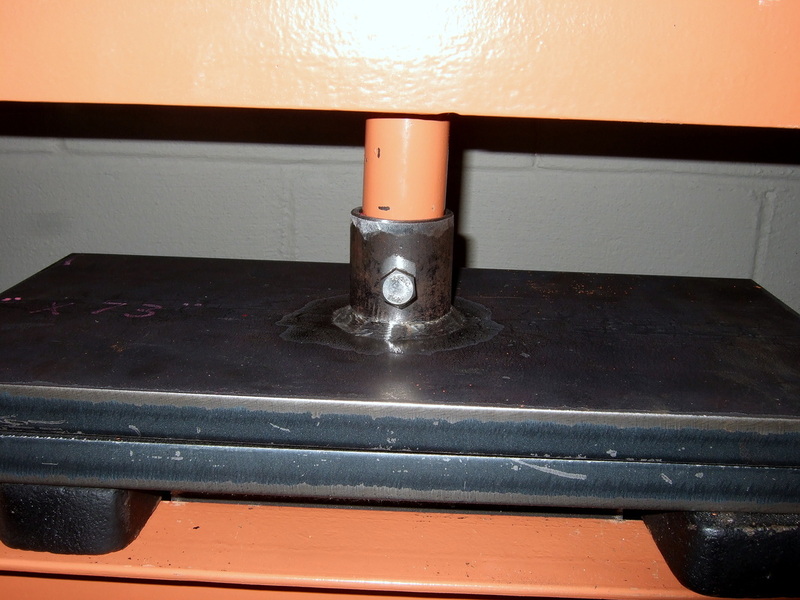 He welded a section of large square pipe to the plate and it drops right between the crossbars of the press to keep it securely in place. The new platens are SUPER heavy. I can't lift them. All the installation was done by someone larger. Here is a shot of the original center section of the press. The two black X-shaped steel pieces came with the press. We decided to use them as spacers under the bottom platen but they can be set aside to make more vertical space. The top crossbar in this image hangs from springs. The bottom crossbar height is adjustable and can be moved lower on the frame to accommodate larger work. To install it, we placed the top platen on top of the bottom platen and then pumped the jack to lower it. Once the rod was completely in the cylinder with platens pressed tightly together, the pressure screw was tightened. I'll update this as I work with the press. The jack didn't work well until we pulled it out and added fluid-- works great now. Regardless, the manual jack requires a fair amount of pumping. Electric ones do exist but I'm ok with this. This setup has no pump gauge so pressure is guesswork. I may wind up buying this torque handle from Potter USA but still need to contact them and ask questions. Update 1/30/2015: Kevin Potter tells me yes, this would work fine. This video explains the tool. Dimensions are going to vary based on the press so I won't share measurements for these square and cylindrical adapters. 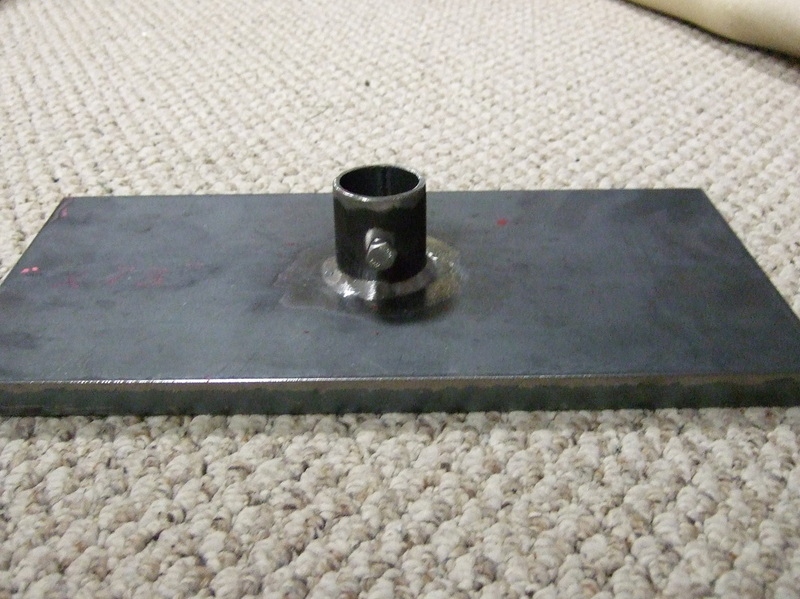 The steel platens are 8x12" and 3/4" thick but this size was not determined by any scientific means. Cynthia Eid, instructor and co-author of Creative Metal Forming, left some great tips on use and safety. Dana Evans outlined her concerns about the top platen's design. She argues for welding it to the frame for structural integrity. 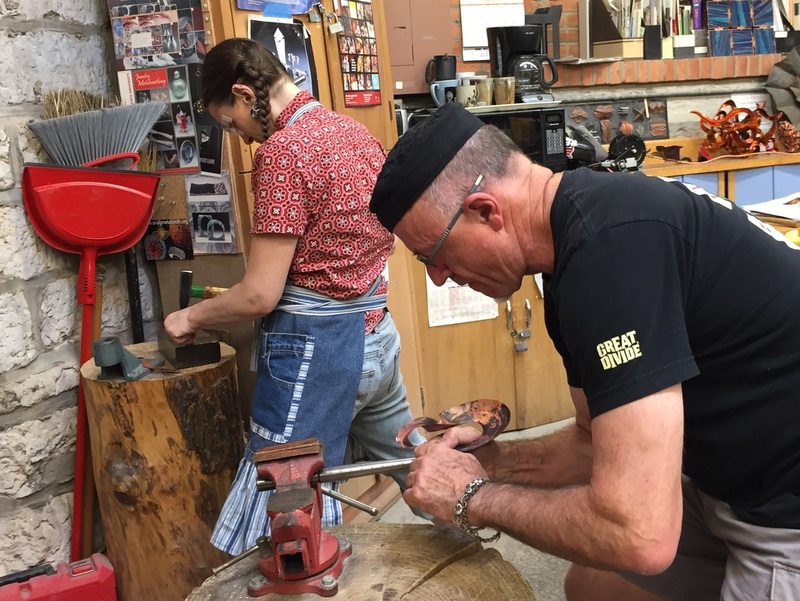 After an offline conversation with metal artist Stephen Fitz-Gerald in Santa Rosa, CA, I summarized his comments in a post under my own name below. He generally works with dies and no top platen, with the arbor intact as-is. Metal artist Brad Severtson left detailed suggestions below based on his own setup with this press. I didn't say a word about how this press is used for jewelry and small metals. Most of you are still reading this because you already know, right? Maybe I'll show some pieces in a future post but in the meantime see this google search for hydraulic press jewelry. 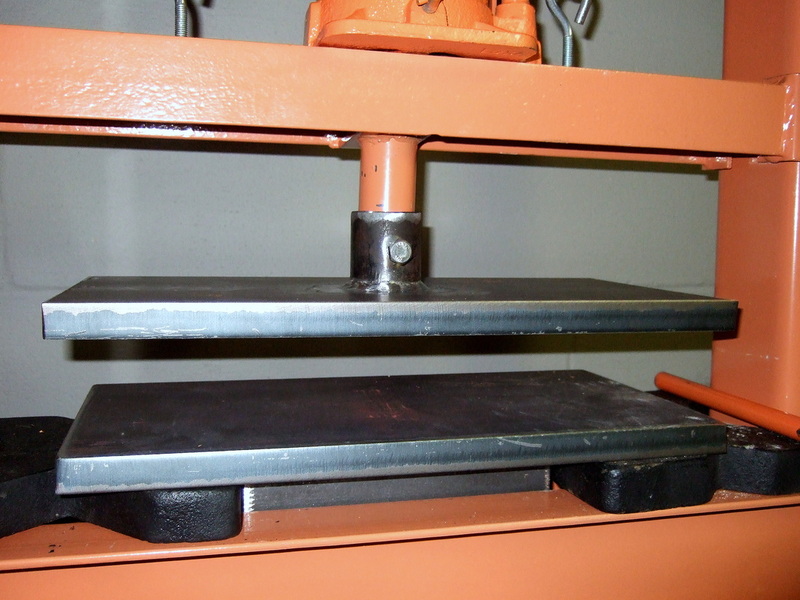 When we released the pressure, each platen was securely in place and ready to go. 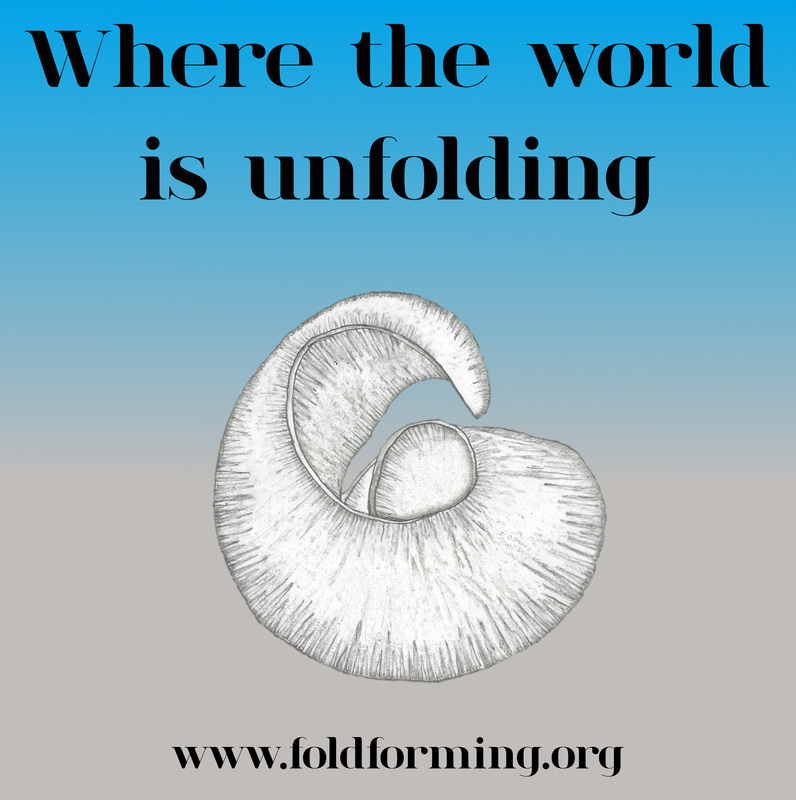 Foldforming at 30- Our book is out! Our book is out! Foldforming at 30: Winners and Jurors' Choice Selections for the Inaugural Lewton-Brain Foldform Competitions. A full color, image-rich celebration of winners and Jurors' Choice selections from the 2012 and 2013 competitions with forward by Charles Lewton-Brain and commentary by Hazel Wheaton and Cynthia Eid. Buy directly from the CMA store or from Blurb. It's already on back order but they come in quickly. UPDATE: There are now two editions available! The Coffee Table edition is 8x10" on high quality 140# glossy photo paper with a glossy soft cover, perfect bound. The new soft cover edition is beautiful quality too-- 8.5x11" on premium 80# matte paper with a semi-gloss cover, perfect bound. This is a link to both and this is the press release. On August 1, 2014, New York's Center for Metal Arts announced the 2014 Lewton-Brain Foldform Competition winners. This video celebrates the winning entries and also twenty Jurors' Choice selections from among entries received from artists around the world. See the full list and winning images below the video and visit Art Jewelry magazine's special online gallery or pick up their November issue. The information hub for this international event is here, a page filled with resources and previous results / videos. Next year's event will be the fourth annual competition, with a deadline of June 15, 2015. FIRST PLACE: “Metropolis Bracelet” by Alison Antelman, Berkeley, CA, U.S.
SECOND PLACE: “Jewel Beetle” by Kharisma Sommers, Quincy, IL, U.S. HONORABLE MENTION: “Strange Fountain” by Heather McLarty, Los Angeles, CA, U.S. INNOVATION AWARD: Hand-formed aluminum by Noah Deledda, Tampa, FL, U.S.
Charles Lewton-Brain, Hazel Wheaton, and Alan Revere. Art Jewelry magazine, Center for Metal Arts (host), The Ganoksin Project, Revere Academy of Jewelry Arts, and Rio Grande. “Sea Slug” by Stephanie Brohman, Iowa City, IA, U.S.
“Faux Diamond Necklace” by Lucy Louise Derickson, Richmond, VA, U.S.
“Purple” by Pat Downing, San Diego, CA, U.S.
“Origami Planes” by Diana Garcia, San Francisco, CA, U.S.
“Autumn’s Touch” and “Lilly Sculpture” by Kerye Hartzell, Richmond, TX, U.S.
“Stolen Moments” by Ed Lay, El Cerrito, CA, U.S.
“Foldformed Granulated Cuff” by Frank Mancuso, San Francisco, CA, U.S.
“Fluted Collar” by Sher Novak, Albany, CA, U.S.
“Echinacea Flower” and “Frilly Peach” by Kharisma Sommers, Quincy, IL, U.S.
“Tiffany Forest” by Gayle Whiteley Minjarez, Santa Barbara, CA, U.S.
“Wall Piece 2” by Roy Ysla, Bethesda, MD, U.S.
What really got me out here, though, is Lewton-Brain Foldform Competition news -- it's so exciting how the event has taken off in just over a year. I have some great publicity to share. The center spread of November's Art Jewelry magazine is dedicated to the 2013 Lewton-Brain Foldform Competition results! You'll see the winning entries (1st place, 2nd place, 3rd place, and our two Honorable Mentions) featured beautifully across the pages. Pick them up from newsstands a week from today! Accompanying the magazine is a wonderful online gallery that includes not only the winning pieces, but all the Jurors' Choice selections too. Readers can click each entry to view the full image with description, and views are tallied right on the page. The other news I have is about me! A couple weeks ago I accepted a fantastic opportunity... I'm now the Acting Director of the Center for Metal Arts (CMA) in downstate New York. SO jazzed about this. This video was one of my first projects in the new position. It's a small window into a magical place. Hope you like it. Pretty sure my next post will be something from the studio. Check back next week and leave me a scolding message if that doesn't happen!! The video is out! Details (from the YouTube description) below. Winners of the 2013 Lewton-Brain Foldform Competition were announced on Aug 5, 2013 by the Center for Metal Arts in Florida, New York at www.centerformetalarts.com. This video celebrates the winning entries and also twenty Jurors' Choice pieces selected from among entries received from artists around the world. Jurors: Charles Lewton-Brain, Hazel Wheaton, and Rhoda Weber Mack. Sponsors: Rio Grande, Art Jewelry magazine, and The Ganoksin Project. 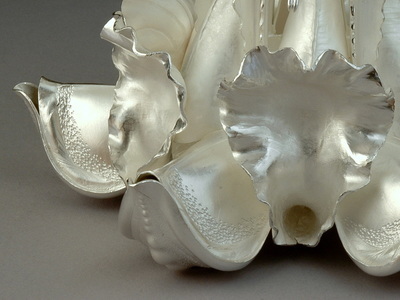 Host: Center for Metal Arts, Florida, New York. Competition Director: Sue Lacy. 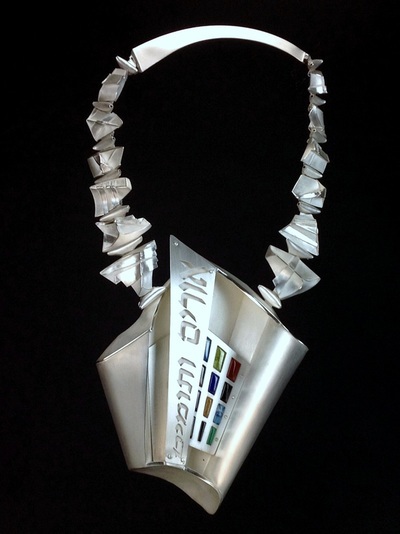 FIRST PLACE: Looking Up At the Sky II, by Yuka Okane Inoue, of Lake Forest, IL, U.S.; Sterling and fine silver, Japanese alloys, diamond. 3 x 3 x 3.5 in. (7.6 x 7.6 x 8.9 cm). Photo by Guy Nicol. SECOND PLACE: Persephone Vase, by Rauni Higson, of Caernarfon, Wales, U.K.; Britannia silver. 55 cm tall (21.7 in). Photo by Clarissa Bruce. THIRD PLACE: FF Bowl 5, by Ed Lay, of El Cerrito, Calif., U.S.; Copper, vitreous enamel. 6 x 6 x 3.5 in. (15.2 x 15.2 x 8.9 cm). 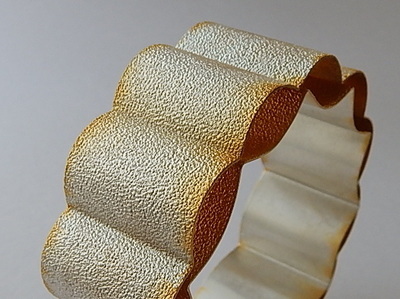 HONORABLE MENTION: Origami Bracelet, by Gayle Whiteley Minjarez, of Santa Barbara, Calif., U.S.; Sterling and reticulation silver. 1 x 6.75 in. (2.5 x 17.1 cm). 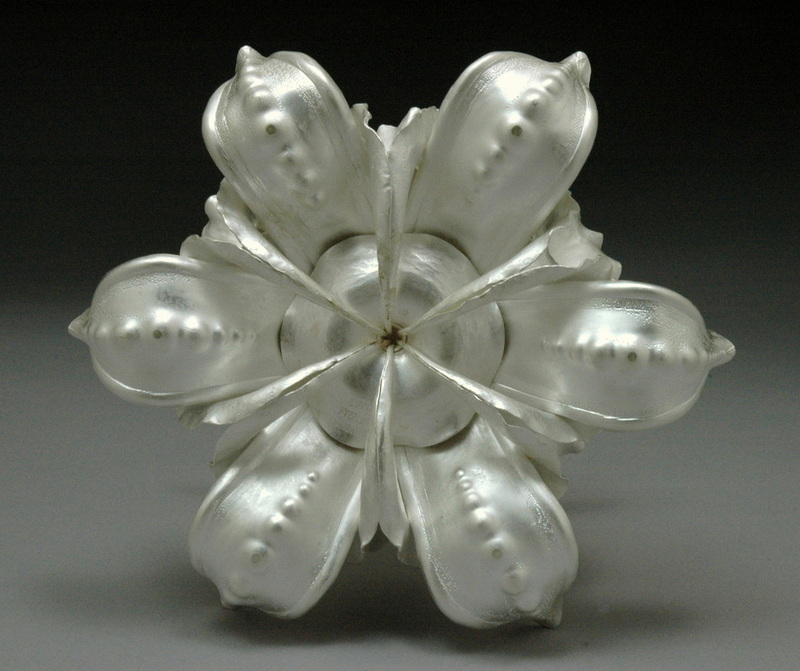 HONORABLE MENTION: Viento en Cara, by Eva Zuzuarregui, of Carlsbad, Calif., U.S.; Sterling silver. 8.5 x 6.5 x .5 in. (21.6 x 16.5 x 1.3 cm). Photo by Seth Papac. Blooming Basket, by Mira Benoni, of El Cerrito, Calif., U.S.; Enameled copper, electroplated copper mesh and branches. 11 x 15 x 7 in. (27.9 x 38.1 x 17.8 cm). 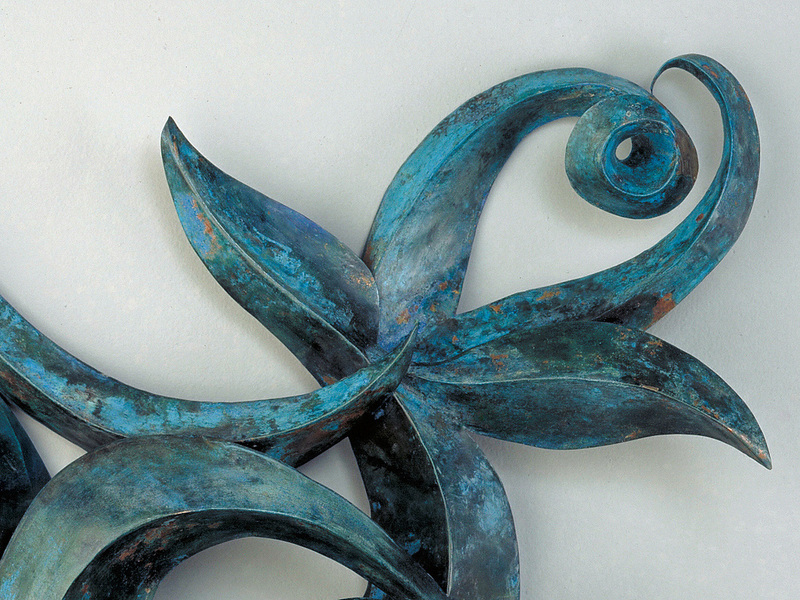 Untitled, by Pat Downing, of San Diego, Calif., U.S.; Copper, steel, patina. 7 x 4 x 2 ft. (2.1 x 1.2 x .6 m). Star Earrings by Robert Fear, of Auckland, New Zealand; Copper, silver. 22 x 22 x 11 mm (.9 x .9 x .4 in). Gathering, by Christine Finch, of Richmond, Calif., U.S.; Copper, vitreous enamel. 8 x 7 x 2 in. (20.3 x 17.8 x 5 cm). Photo by Ed Lay. Fore-armed, by Rauni Higson, of Caernarfon, Wales, U.K.; Patinated gilding metal. 14 x 11 cm (5.5 x 4.3 in). Photo by Jan Davies. Spinal, by Rauni Higson, of Caernarfon, Wales, U.K.; Patinated copper, 21 x 18 cm. (8.3 x 7 in). Photo by Jan Davies. Find Me; I'm Here, by Yuka Okane Inoue, of Lake Forest, IL, U.S., Copper, sterling silver, found object, diamond. 5.1 x 3.5 x 1.6 in. (13 x 8.9 x 4.1 cm). Photo by Guy Nicol. Rip Tide, by Denys Knight, of Bonners Ferry, Idaho, U.S.; Copper, Swarovski crystals. 7 x 10.5 in. (17.8 x 26.7 cm). Winter Moon, by Denys Knight, of Bonners Ferry, Idaho, U.S.; Copper, silver. 2.38 x 6 in. (6 x 15.2 cm). FF Bowl 6, by Ed Lay, of El Cerrito, Calif., U.S.; Copper, vitreous enamel. 10 x 10 x 4 in. (25.4 x 25.4 x 10.2 cm). Salt and Pepper Shakers, by Kenneth MacBain, of Morristown, NJ, U.S.; Sterling silver, topaz, garnet. 5 x 2.25 x 2.5 in. (13 x 5.7 x 6.4 cm). Salt and Pepper Shakers (2), by Kenneth MacBain, of Morristown, NJ, U.S.; Sterling silver, 18K gold, topaz, garnet. 3.5 x 1; 5 x 2 in. (8.9 x 2.5; 13 x 5 cm). Por Frida, by Mary K McIntyre, of Toronto, Ontario, Canada; Bronze sheet. 7 x 5.5 x 1.5 in. (17.8 x 14 x 3.8 cm). Photo by Paul Ambtman. 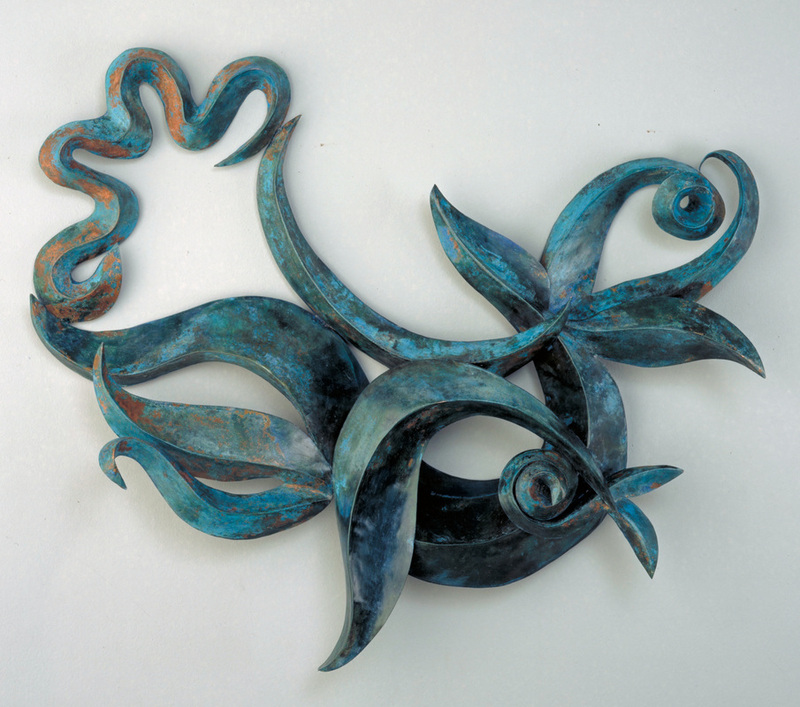 Georgia's Orchid, by Mary K McIntyre, Toronto, Ontario, Canada; Bronze sheet. 5.5 x 6.5 x 2 in. (14 x 16.5 x 5 cm). Photo by Paul Ambtman. 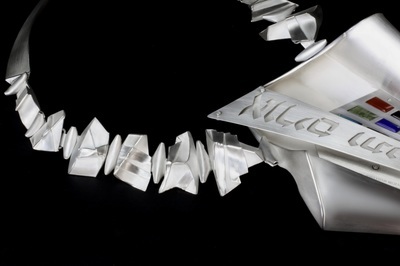 Evolution, by Kaiya Rainbolt, of San Diego, Calif., U.S.; Steel, vitreous enamel. Six pieces; 8 x 8 x 4 in. (20.3 x 20.3 x 10.2 cm). Leafy Sea Dragon, by Liz Reed, of Naracoorte, South Australia; Copper. Dragon height 5 in. (12.7 cm). Photo by Steve Bourne. 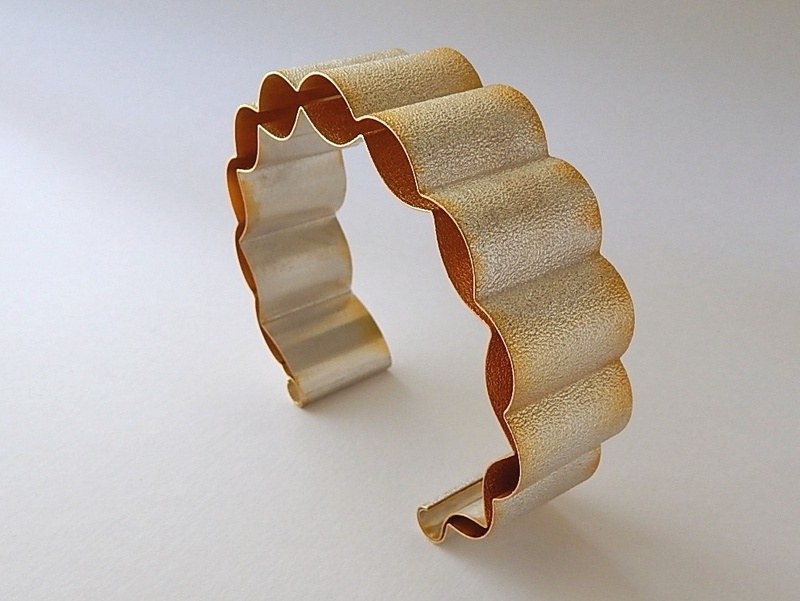 Zipper Cuff, by Greta Schiegg, of Cottonwood, AZ, U.S.; Sterling silver. 1.5 x 2.5 x 2.25 in. (3.8 x 6.4 x 5.7 cm). Photo by Jerome Photos. Swirling Leaves, by Susan Thornton, of Watertown, TN, U.S.; Sterling silver. 4 x 4 x 2.75 in. (10.2 x 10.2 x 7 cm). Photo by John Lucas. The annual competition is open to artists everywhere and coincides with the Charles Lewton-Brain Conference on Foldforming. Both are hosted by Center for Metal Arts in Florida, New York. Visit www.centerformetalarts.com for more information; visit SueLacy Wired at http://tinyurl.com/8ore8nh for an extensive live blog documenting the 2012 conference in text, photos, and video.